Many of us have poison coursing through our veins. For some men this poison is quite literal, while for others it is very much metaphorical. But whichever it may be, the “poison” that slowly kills a man comes in many forms. For some it is a poison of their own making, for others it is not. Similarly, some poisons may be worse than others, or may affect men differently and to varying severities. But in the end we all have our crosses to bear. 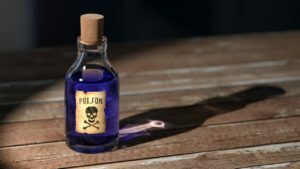 And while most may spend their entire lives trying to fight the toxic effects, at some point the poison ultimately takes its toll—one way or another. The late Gregg Allman once sang, “I love the poison…but it’s killing me”. And while Gregg was most likely referring to his long battle with drug addiction, the “poison” that kills a man takes many forms. So I too know the feeling Gregg, except that I hate the poison…but it’s killing me. I have known about the poison corroding me for a very long time, it is not some new revelation in my mind. But the other day I had an epiphany. This epiphany was not really the addition or acquisition of some new information or knowledge. All of the pieces were already there, innately embedded in my mind by decades of academic study, intellectual insight, and personal experience and introspection. All I did was simply rearrange the pieces and connect them in a way I had never consciously recognized before. It was not even some groundbreaking realization. In fact it was really quite obvious in its simplicity. Yet for whatever reason, it had never presented itself to me this way before. Mine is the poison of intellectual knowledge and insight combined with years of real-life personal experience and observation—relating to our diseased modern society and the pathogens destroying it. And while I have always been consciously aware of both of those pieces individually, and the negative affects each has on my psyche and overall outlook on the world, for some reason it had never occurred to me to connect and multiply them. What I mean by that is, while I have always understood that one piece was an academic and intellectual understanding of the macro “big picture” and the other was a collection of firsthand experiences and observations on the micro “day-to-day” level, I never perceived—at least consciously—the exponentially negative psychological effects that result in combining the two. For to combine an intellectual understanding about the realities of society and human nature with a daily validating exposure to it at its absolute worst is poison. It is corrosive and toxic to the body, mind, and soul. And it is a poison that few men will ever fully know or taste. A wise and educated traditional man may be intellectually aware of the realities, chaos, and insanity of the modern world and society. He completely understands the macro-level “big picture” on a social, cultural, and historical scale. He has read the books and articles and he follows the news and current events. As a result, he has drawn his own educated conclusions derived from academic and intellectual knowledge and perhaps even some limited personal experience. Simply put, he has a fundamental grasp on objective reality and truth, and he intellectually recognizes the dire issues facing modern society and civilization. From a “large scale” academic perspective, this man is fully aware of what is going on around us. Such poisonous knowledge likely angers this man, and it may even negatively affect his outlook and personality to some degree. But more than likely, he is still ultimately detached or removed from the harsh realities of society. They do not directly affect him, although he knows they are there. Because although he may understand the big picture and even have some limited first hand experience, his own personal life and direct experiences largely remain separated from the real-life situations and consequences he inherently knows to be true. He usually does not have to see or deal with them. More than likely, he has carved out his own little niche in life—family, decent home, friends, career, hobbies, etc. Such things have likely insulated him and prevented him from having to be exposed to what he otherwise knows to be true. He is therefore able to find some sense of happiness and shelter beyond it. So while he may know and understand what is happening on the macro-level, he generally doesn’t have to see or deal with it directly on a daily basis. He carries only half of the pieces, and his taste of this poison remains limited. Conversely, there may also be a traditional man who does indeed have direct firsthand exposure to the day-to-day realities and consequences of our social and cultural decline. He routinely bears witness to the micro-level ramifications and chaos plaguing our putrid modern society. For whatever reason, he walks in the muck daily and deals directly with the people, problems, and social disorder flooding over us. He has been exposed to the filthy underbelly of society and has witnessed some of the worst humanity has to offer. He has observed first-hand the parasites and junkies, criminals and exploiters, predators and psychos, and freaks and degenerates of toxic modern society. Yet he is also familiar with its legitimate needy and broken victims as well. He therefore keenly understands the “street level” truth and realities of our afflicted modern world as well as the truth about human nature and what people are capable of. Thus his mind is not readily blinded by the absurd excuses, justifications, and rationalizations created by the left, it is hardened by the truth. Yet he too is likely to be angered by such poisonous knowledge, and it may even negatively affect his outlook and personality to some degree as well. But despite his immediate personal knowledge, this man is not particularly knowledgeable about the greater macro-level situation. Whatever the reason may be, whether by choice or an inability to intellectually conceive it, this man does not fully understand the larger game at play. He is intimately familiar with the experiences he is directly exposed to, but he is unable to place them into the larger context. So although his experiences may negatively affect him somewhat, they ultimately remain isolated from a greater understanding. And like the first man, this man may have also carved himself out a pleasant niche in which to seek shelter from the darkness. His mind, though hardened by his experience, is pacified by diversionary happiness and a lack of overall knowledge. He too then carries only half of the pieces, and his taste of this poison remains limited as well. To look at it another way, imagine a very large mural painted across the side of a building. The first man, standing far back away from the wall, possesses a heavily “zoomed out” view of the overall picture but is largely unable to see and appreciate the fine details up close. He may have a “sense” of the fine details, but he does not really see them. The second man, standing right up against the wall, possesses a very up close and “zoomed in” perspective but only of a small section of the picture. He is innately familiar with the fine details in front of him, but he lacks the overall view of the entire picture and is therefore unable to appreciate the full mural. Likewise, he may have some “sense” of the big picture, but he does not really see it. Simply put, one perspective is more far-sighted while the other is more myopic, but neither perspective is able to capture the full effect of the painting. And then there are those men, myself included, who possess both perspectives to the picture, who have collected more pieces to better fill-in the complete puzzle. Men who are exposed to the full effects of the poison in all its corrosive potency. It was this admittedly simple revelation which was my aforementioned epiphany the other day—to awaken and consciously realize how damaging the combining of both perspectives could be to a traditionally minded man. It can be absolute hell, and is potentially caustic to the body, mind, and soul. For me, I possess a rational, logical, and analytical mind, and I think often about our modern state of affairs. It fascinates me as much as it appalls me. I have read the important books and classic literature and relevant articles on the subject. I pay attention to the news and current and world events. I have studied in depth the philosophies, psychology, narratives, and ideologies of leftism, and I am well versed in history. I am observant of social and cultural trends, and I know the realities and truths about society and human nature. Ultimately, I fully comprehend the nature of leftist sociocultural subversion and degeneracy, and I recognize the disastrous effects they are having on society. Lastly, I write articles and essays expressing my thoughts and opinions on these matters. On an academic and intellectual level, I have a very firm grasp on what is happening to modern society and Western civilization as a whole. I can see through all of the lies and propaganda and delusional insanity to discern the truth. I don’t profess to know everything, but I know enough. And it saddens me. It sickens me. It enrages me. Yet I have also seen the realities of our diseased and degenerate society up close, in places and situations few will ever see or know. I have personally witnessed the violence and blood, the hate and division, the chaos and crime, the corruption and exploitation, the catastrophic system failures, and the mass degree of social disorder. I have walked through the dysfunctional slums and ghettos, and I have witnessed the dark side of suburbia. I have stared into the eyes of the devil and have heard him speak. And because I am exposed daily to the filth and decay of modern society, my intellectual knowledge becomes much more than mere academic speculation or detached abstract reasoning. It becomes validated by firsthand personal experience and observation. As a result, many of the symptoms and consequences of society’s decline become plain to see. I am able to place them into the overall context. They cease being isolated or unrelated events, and instead become part of the much larger pattern. I don’t claim to have seen everything, but I have seen enough. And it saddens me. It sickens me. It enrages me. Such a toxic combination of insight and validation takes a toll. How could it not. It leads to anger and disgust and a jaded nihilistic outlook. It salts the very earth of the soul. But maybe it’s my own fault. Maybe I am unrealistically holding society to some idealistic vision that can never be. Though mine is not a standard naively set by some egalitarian utopia or nostalgic longing for the past, but rather a realistic understanding of natural law and the mechanisms that actually make a healthy society work. Obviously there is no such thing as a perfect world, but there can be a more perfect one. And no matter what, I will never make excuses, rationalizations, or delusions to justify or accept this toxic society we call home. Because I know and have seen the truth. But again, maybe I expect too much. In the end, when one is able to witness and perceive both perspectives to the picture, it becomes that much harder to ignore and escape from. The poison becomes compounded and is that much more toxic. For me, the interconnected knowledge is always there. It will always be there, despite relentless attempts to find happiness and solace to quiet the raging of the mind. I cannot silence it. The mind’s eye, once opened, cannot un-see what it gazes upon. So I suppose there is truth to the saying that ignorance is bliss. And yet although the poison pill of knowledge and truth is a bitter one to swallow, it is one I still choose to take. So perhaps, in the end, I too love the poison…but it’s killing me. This entry was posted in Philosophy. Bookmark the permalink. Follow any comments here with the RSS feed for this post. Both comments and trackbacks are currently closed.